To provide service excellence in nursing care & emotional and spiritual support to our patients and their families/caregivers. To provide a spirit of acceptance, honest communication, mutual respect, quality and compassionate care to all patients. To be a resource for any question or need the patient or family may have. Hospice is a special type of care for people who are facing serious illness and who have a limited life expectancy. 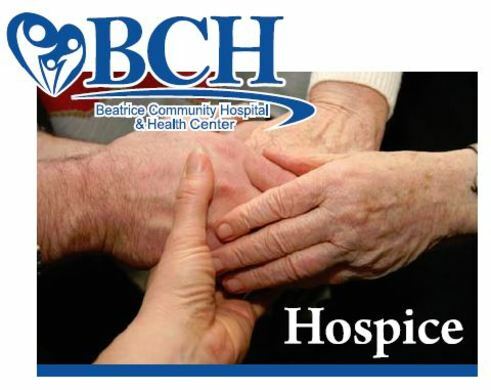 Beatrice Community Hospital Hospice is able to provide physical, emotional and spiritual support for patients and their family members in the patient's home, in the home of a family member, a nursing home, senior apartments or an assisted living facility -- wherever the patient calls home. Hospice care focuses on comfort as opposed to a cure and BCH Hospice staff are dedicated to helping individuals facing terminal illness to experience the best quality of life possible. BCH Hospice has been named a 2016 Hospice Honors Elite recipient, a prestigious award recognizing hospices providing the best patient care as rated by the patient’s caregiver. One of the first hospice providers in the state of Nebraska, serving the Beatrice and surrounding communities for the past three decades. The only not-for-profit hospital-based hospice provider in Southeast Nebraska. 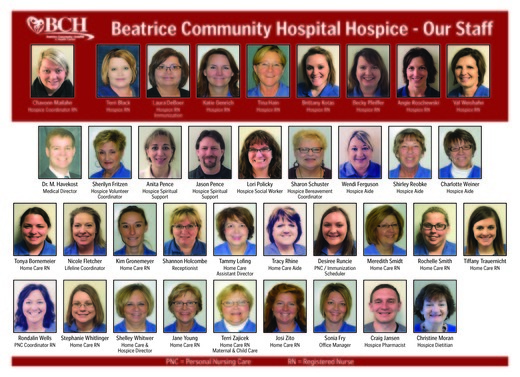 We are part of the BCH Home Care Team, with offices located at 1110 Jackson St. in Beatrice, and work with BCH Home Health and Personal Nursing Care to provide comprehensive services for hospice patients and their families. We are a preferred provider by Beatrice Community Hospital and Health Center physicians. Nearly 98 percent of our patients' families would recommend BCH Hospice and 95 percent of patients' families reported that BCH Hospice met or exceeded their expectations. "Thank you for being angels." would "light up" when Janice came to do her visits. It takes very special people to do what your team does. thank you!!" provided by the Hospice Team. Thank you." "Keep doing what you do do. The Hospice Team are knowledgeable, helpful, wonderful and awesome!!" "We were very happy with the care and services provided by hospice. Dawn especially spent a lot of time answering our questions and supporting us. We really appreciated the entire hospice team. Thank you!" "For the short time my husband was in your care, your staff took excellent care of him. I appreciate all you've done for him." "I don't know of anything else you could do to improve your services, which are outstanding." "Our hospice nurse was wonderful during our two losses." " I don't know what more you could have done. You were always there. I am so glad we had the support of hospice." "If I had known then what I know now, we would have signed up for hospice services much sooner." "I cannot imagine any better care than that provided by the Hospice Team. You are all wonderful!! Thank you, thank you!! A Hospice Informational Visit is provided to anyone considering Hospice services; call 402-223-2366 for more information. This five week video/discussion series is available throughout the year. To register for one of these classes, call BCH Hospice at 402-223-2366.